Fall in love with every detail of this newly remodeled home. Elegant 3 bedroom 2 bath concrete block home. This stylish home is in pristine condition offering over 1500sq ft on a beautifully landscaped and large fenced backyard. The NEW kitchen features rich dark wood cabinets solid granite countertops modern backsplash stainless steel appliances and a spacious breakfast bar areas. Both NEW bathrooms have been completely updated with dual sink vanities framed mirrors sleek contemporary tile and granite counter tops. NEW wood-look ceramic tile floors throughout the home. Features on an open floor plan including a separate 300sq ft Family Room - the perfect space for your entertainment center or large flat-screen TV. Plenty of closet space extra storage closets and an indoor utility room. Oversized driveway provides parking for up-to 6 midsize vehicles (one covered parking space). 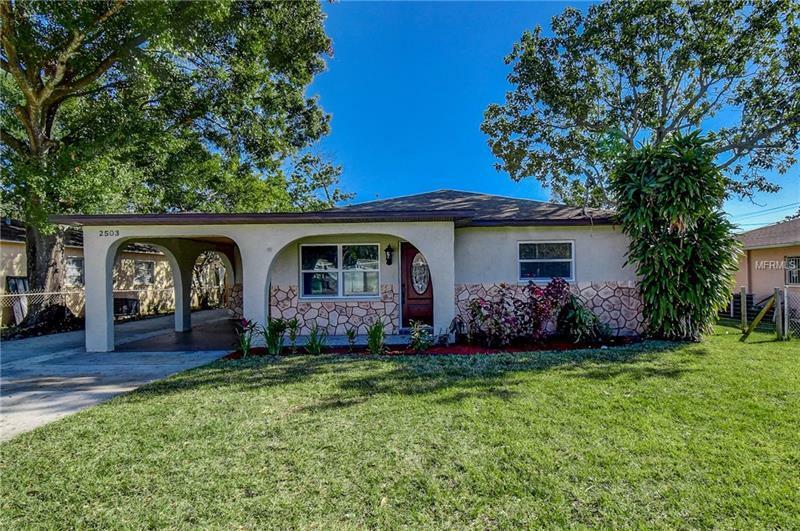 Additional upgrades throughout the home include fresh paint NEW lighted ceiling fans NEW light fixtures NEW tankless hot water heater NEW leaded glass front door and NEW A/C. This home is move-in ready and centrally located near I-275 Raymond James Stadium International Plaza St. Joseph's Hospital local cuisine fine restaurants and downtown Tampa. Must see to appreciate.